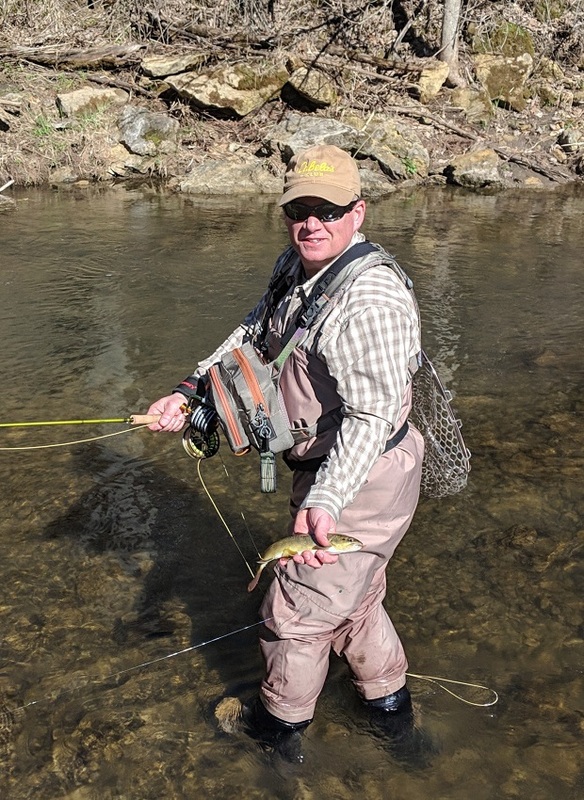 I guided both Friday and Saturday, and the common themes for both days were excellent weather with lots of sun, clean water, awesome clients, and hungry trout. I spent the day with Wes and his dad, fine tuning Wes's skills at times, and working with his dad so his son wouldn't out fish him. Friday was a little cooler in the morning when we first started out, but fishing was good right out of the gate. Tandem nymph rigs was what we fished all day. 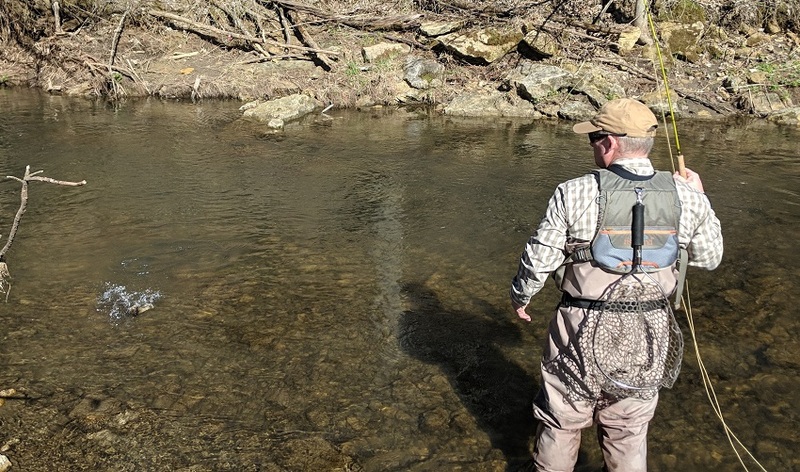 In the afternoon we moved around to other streams in the area to get Wes and Jeff on the one trout species they hadn't caught yet: the brook trout. Saturday was var similar in conditions to Friday with the exception that it warmed quicker than Friday, which kicked the afternoon bite on pretty intensely. Same rigging set up Saturday as Friday with the exception that we used more caddis trailers, ace, ultimately, put on caddis dries and took a few trout on top. My client Rick is a great guy, and we ironed out some casting fundamentals, all while still having a big day in the numbers department. 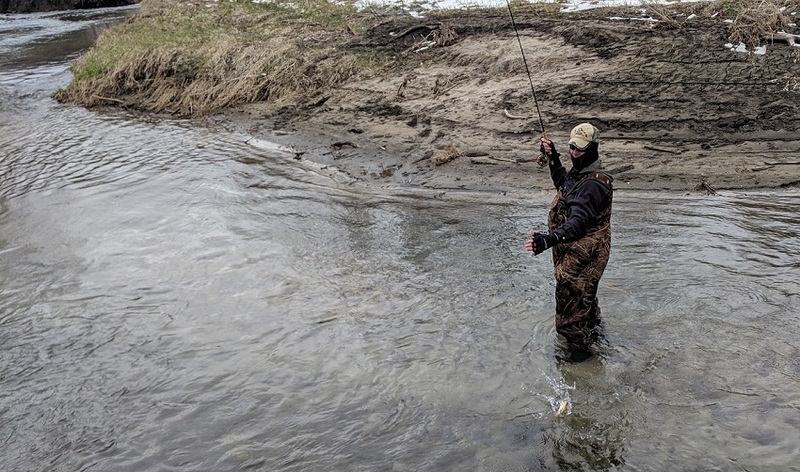 I spent the harvest opener with Darin from the Twin Cities area, and like all guys heading out for the trout harvest opener, my main concern was people: how many and where. Turns out, the latest round of snow and cold deterred many as we literally ran into no one yesterday. 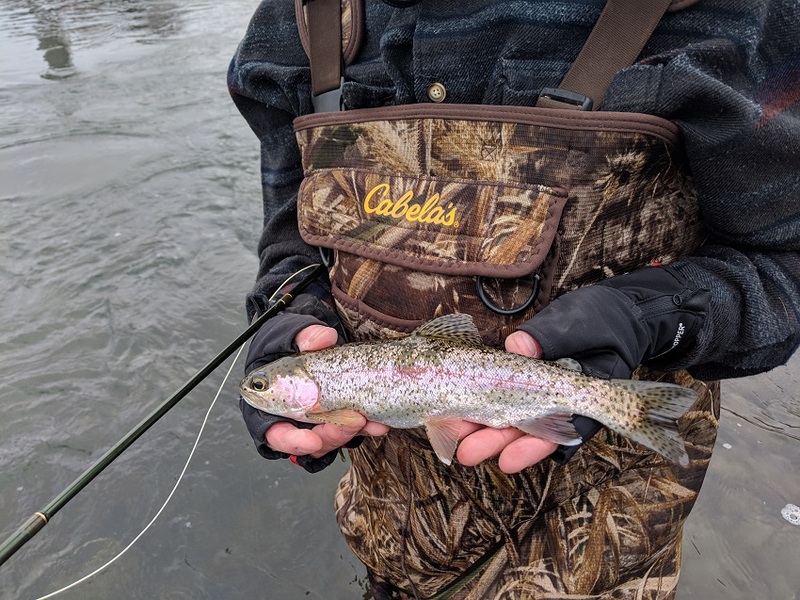 We started out on the first stream, geared up as if we were sitting it our in a duck blind for the day, but we caught fish on some standard nymph patterns. 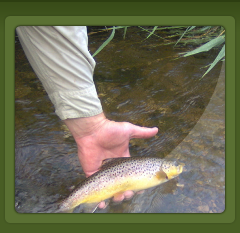 Water clarity was excellent all day, so the latest round of wet weather did little to nothing to dirty up the streams. We finished up on our first stream and headed to the afternoon spot. Nothing changed from the morning to the afternoon when it came to fly choices. 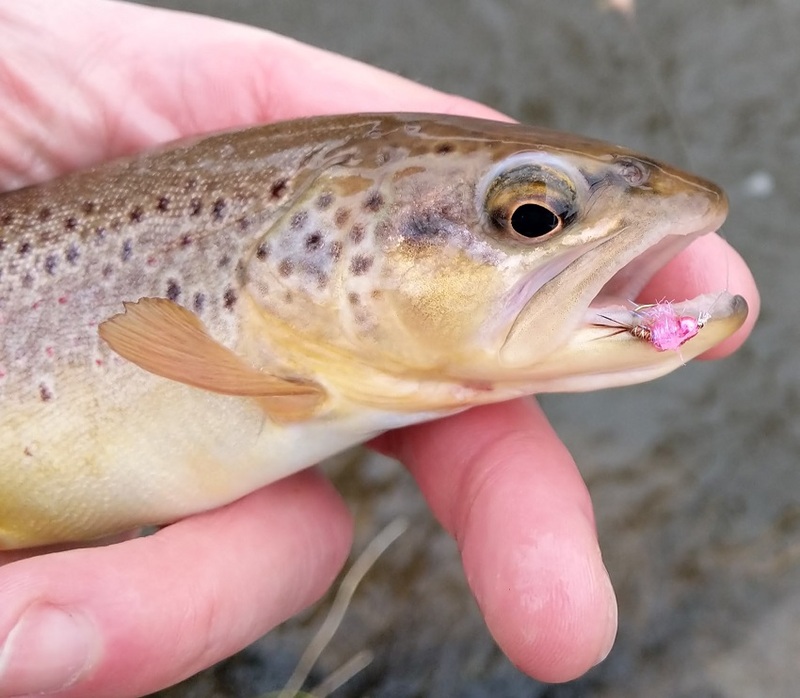 It never warmed enough to get some BWO's going, but it had the looks of a baetis kind of day. As a first time angler, Darin did great! 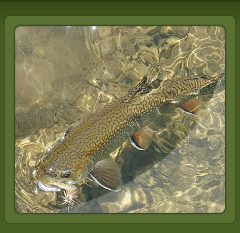 He caught and released well over 25 trout and tangled with many more that never came to hand. 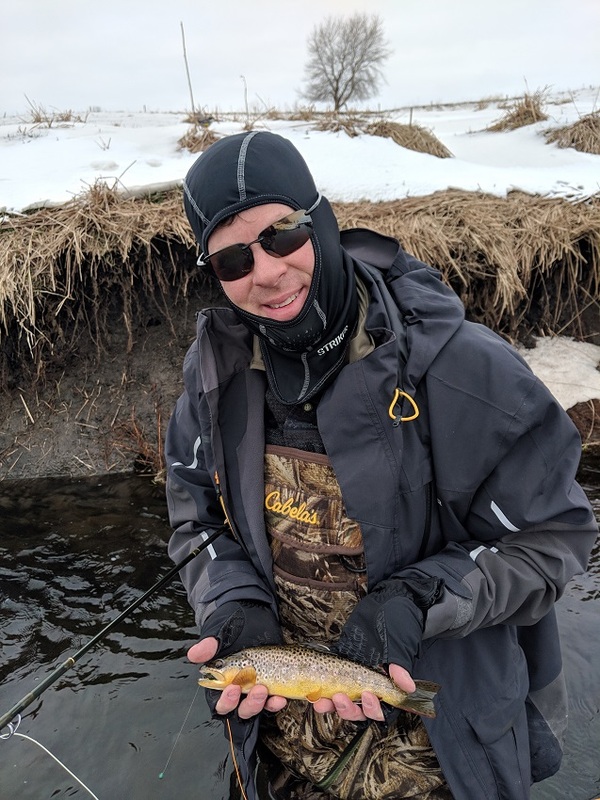 It's always a pleasure showing people around southeast Minnesota and getting them on some trout. 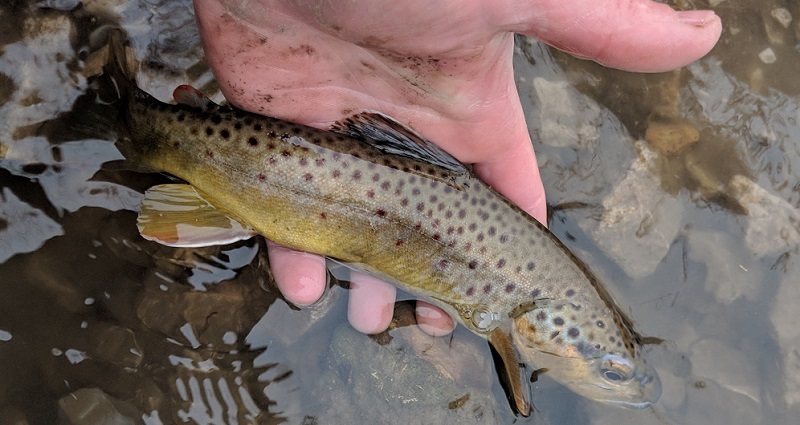 I spent most of Saturday on the water, and dive past several other streams along the way that I didn't fish. As of right now, the common theme is clean water (overall) with plenty of in stream volume. 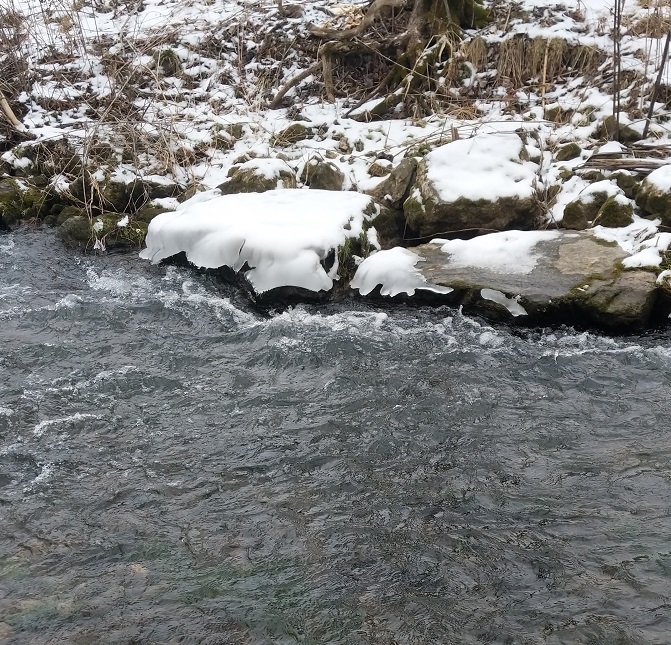 My first stop I hit an upper headwater area: small, clean, and very fishy looking. Midges were everywhere, but there were no trout rising to pick anything up (another common theme from yesterday). Basic nymph rigging was the way to go all day. 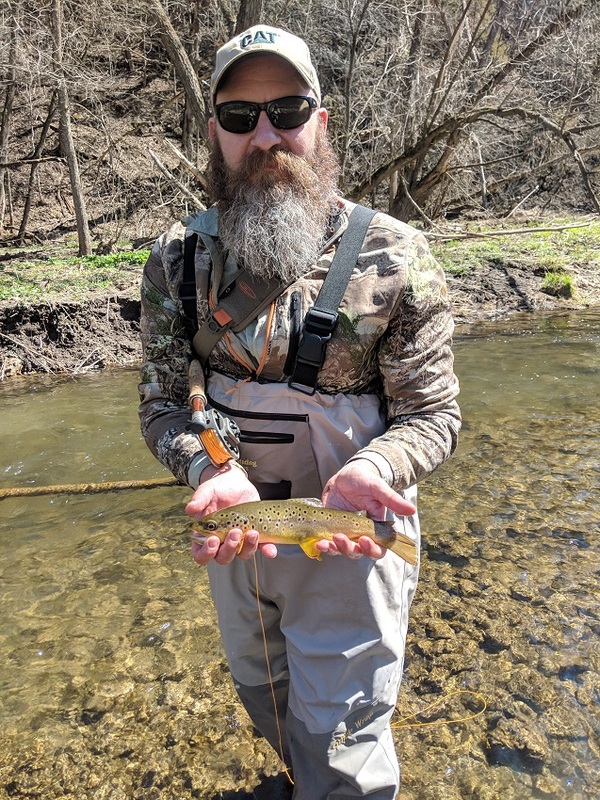 I'm not usually a big fan of Driftless rainbows, but these holdovers were impressive in color and size. The second and third stop were more of an open settings, and by this time, the rain that was falling early in the morning gave way to warmer weather, a little bit of wind, and even some sunshine. My hopes were high that something was going to hatch - BWO's, Dark Hendricksons, being the likeliest of hatches. 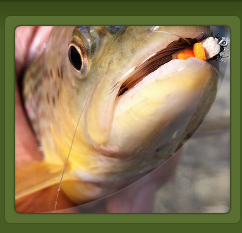 Nothing ever did come off; however, that didn't stop the fish from taking flies all day long. Yesterday's set up was a Sage X 9' 3 weight with an Orvis LA reel, SA Amplitude WF3 fly line, a 9' Rio Fluoro Leader. I fished 5X Rio Fluoro all day, every day as usual. Nothing against the Great Waters Expo, but I opted to take a chance and check out the waters south of my home instead of venturing north to hobnob with friends, industry pros and insiders....the works. 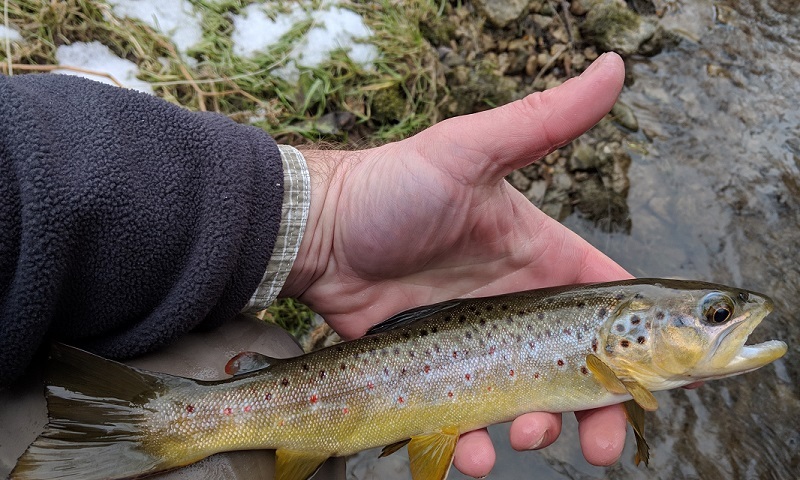 It wasn't particularly warm this morning (26 degrees when I rigged up), but no one was looking to fish, and I had the whole stream to myself. I fished a 9' 4 weight Sage X with 4X Rio Fluoro leaders and tippet. 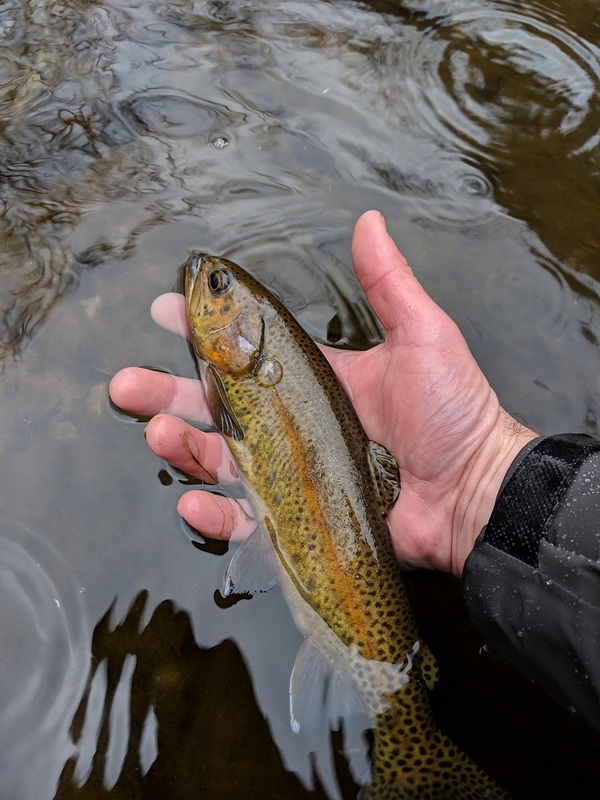 The water was stained, but definitely enticing this morning, so I went with a gray leech out of the gate with minimal success. 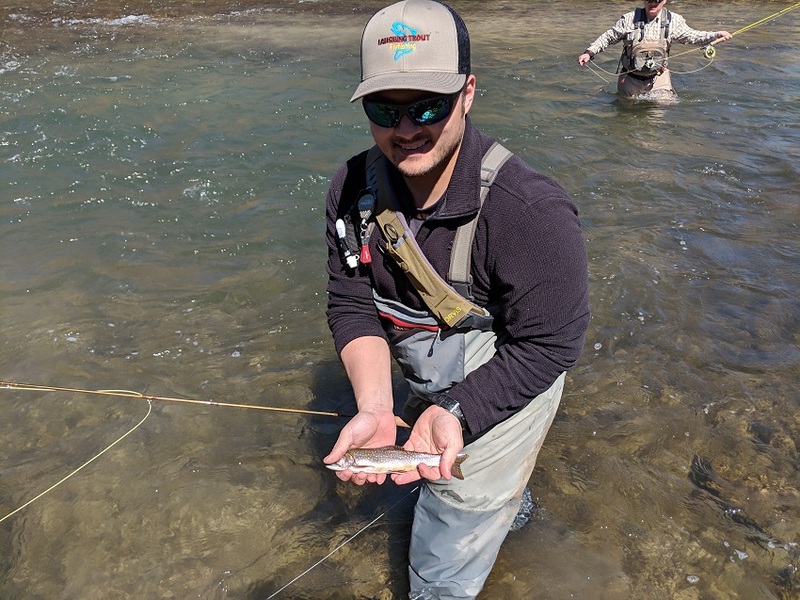 I switched to a scud trailed with a pink beadhead PT (no fancy name required) and immediately caught fish the rest of the day. 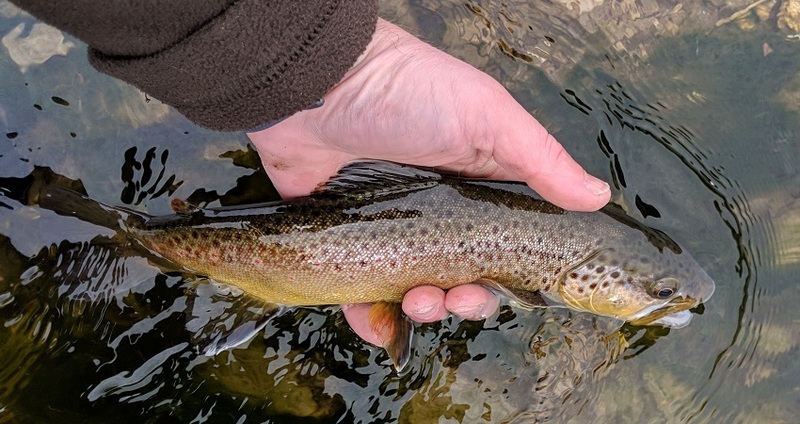 Fish were holding at the tails of the pools early on, but I did catch fish in skinny water and the heads of runs throughout the day. I got to try out my Fishpond Gunnison Guide Pack as well. It's an RV sized waist pack that hold everything you will need on the water without the issue of a huge, bulky pack. I've not been a vest guy for many years, and the Gunnison reiterates the reason why I will never go back to a vest. It will be ideal this summer on the annual pilgrimag to Wyoming and some long treks from the car. The news isn't all good right now. There will definitely be some serious run off come Thursday-whenever as temperatures are going to climb into the 50's and not dip below freezing overnight. The plus side is that we should be relatively snow free in ten days or so, just in time for some decent baetis and DH right behind them. Southeast Minnesota is finally done digging out of a 10-14" snowstorm on top of the several feet we had already this month. The Rochester, MN area snowfall total for February is at 39.7". 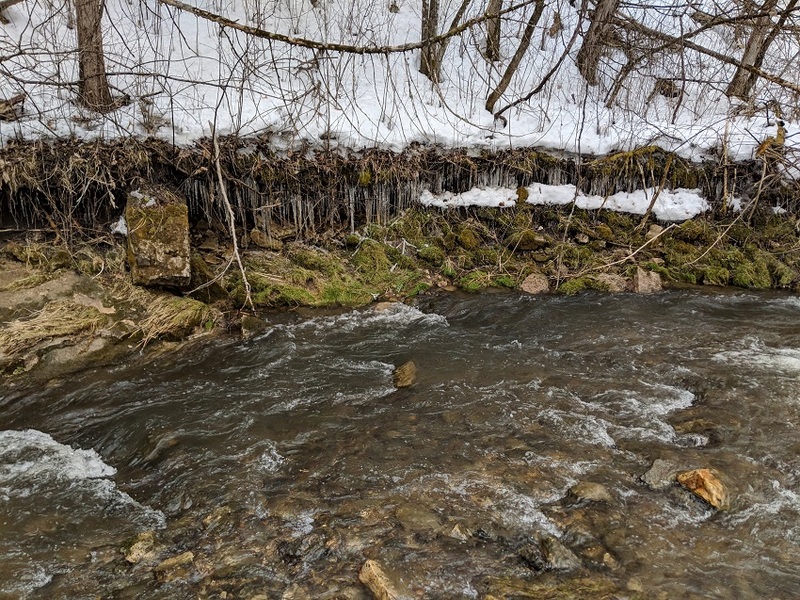 The good news is that there should be plenty of water this spring...the bad news is that it could significantly wipe out YOY and some to most of our spring hatches IF it melts way too fast. Streams are cetainly fishable right now. The problem is getting in and out of them with the significant snowpack. At this rate of snow and cold weather, there will still be significant snow on the ground in southeast MN by April 1. That doesn't mean fishing can't be had, however. It just means that anglers are going to have to adapt their game to fit the situation. 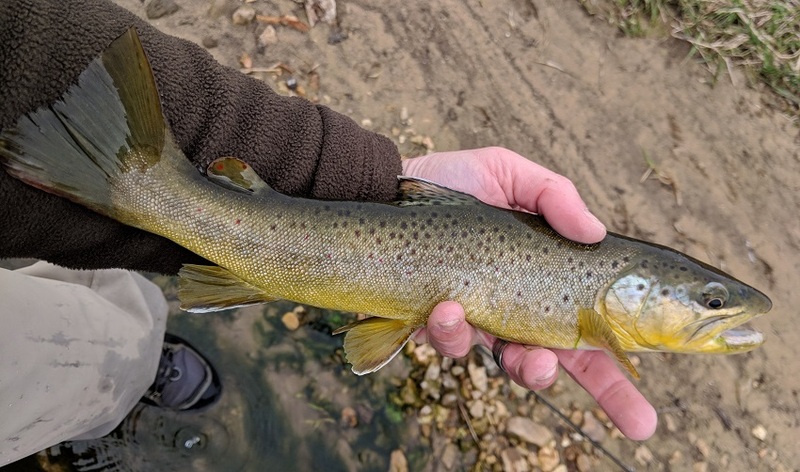 This past Saturday would have been the better of the two days this past weekend to fish, weather wise, but I could only manage a Sunday trip. I arrived on the stream ready to shake the rust off of a few months off. It was a whopping 27, overcast, with a definite bite in the air. A twenty minute walk back in through less than January like conditions warmed me up a bit. 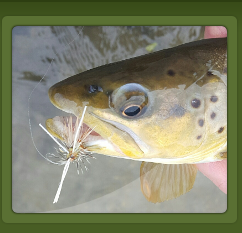 I started witha scud and a zebra midge, but quickly ditched the midge in favor of a small beadhead stonefly. 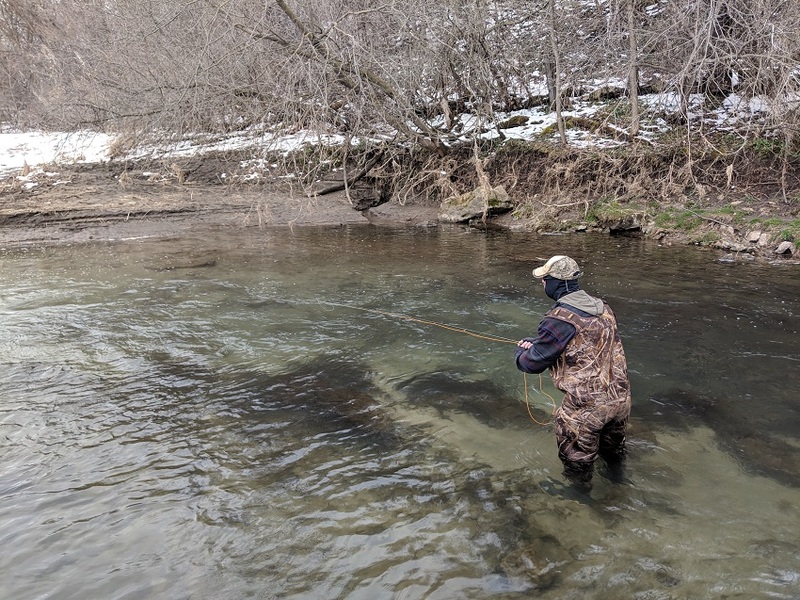 The stream was less than crystal clear due to the prior day's runoff, but it was very fishable. I did well for the three hour so hours I fished. No fish were on top taking midges, but they willingly picked up my nymphs. I pulled the plug and hit a second stream on my way home. 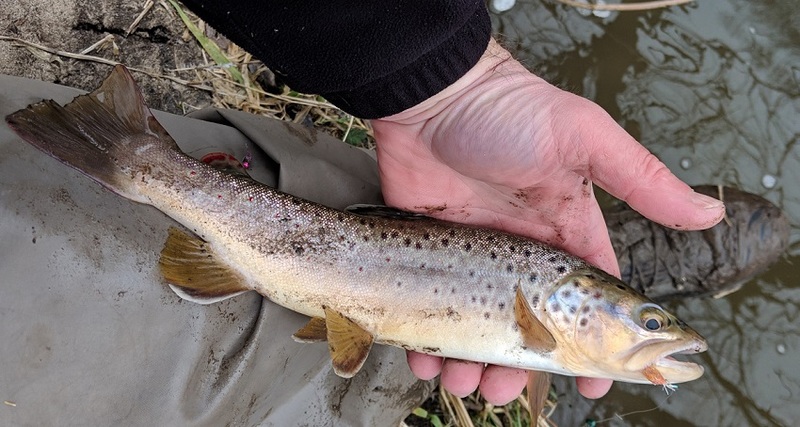 This one was much cleaner and, actually, the fish were even more eager to pick up flies (scud with a soft hackled midge emerger). I fished until around 2:00 and decided to get back to the confines of my warm vehicle and head home. Great "opening" day for me. There are definitley lots of trout out there right now.